As humans, we’re often influenced by our surroundings. The colors on our walls, the items in our rooms, and the clutter (or lack thereof), can all contribute to our mood and state of mind. So what does this tell us? Well, if you want to enhance your mental health or increase your productivity, then upgrading your surroundings is a great place to start. Read on and learn my favorite strategies to do just that! First things first, get rid of everything you no longer need or use. It’s so easy for clutter to accumulate over time, so going through your belongings on a regular basis helps you to stay on top of things. By getting rid of items you don’t need, you can free up space for the things you do. That way, you don’t waste valuable time rummaging through unnecessary stuff. Once you’ve streamlined your possessions, it’s also helpful to find good storage systems so that you can put everything away properly. When everything has a place, you’ll have a much easier time staying organized overall. If you want to maintain a clean and tidy home, then create a space that makes it easy to do so. One of the best ways is to embrace a minimalist look, which simply requires less work when you’re vacuuming, dusting, etc. Choosing the right surfaces is also a smart move. Hard flooring such as CSG West – Cornerstone Granite and Floors or solid wood flooring is much easier to clean and maintain compared to carpets – especially if you’re a pet owner like me! Similarly, wipeable paint is resistant to most marks and stains and is quite easy to clean with a damp cloth. Instead of decorating with lots of smaller items, choose a few key statement pieces. For example, a large potted plant will add color and texture, a statement light fitting will add interest, and a few cushions will add pattern and incorporate an accent shade. In short, you don’t need to fill a room to the rafters with knick-knacks for it to look homey. Color psychology is a growing field of science, and we continue to learn more about the different ways that color affects our mood and perceptions. Perhaps one of the most familiar ways in which color is used is in marketing campaigns since certain color combinations cause us to interpret things in different ways. They can make us think we’re getting a good deal (red tag clearance!) even make us hungry. Well, the good news is that we can use color psychology in our homes, too, to create a relaxing and serene environment. Neutral colors are always a good option, especially white, magnolia, or very light grey. Blue is perceived as soft and soothing, so it is ideal for relaxing spaces, while green has more of a calming effect. Generally, choose light colors, which will help make your room feel as airy and spacious as possible. There you have it, friends! 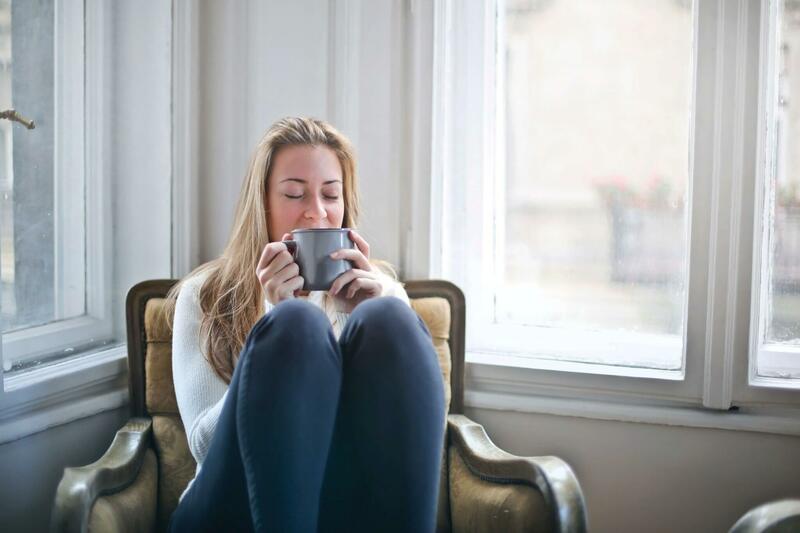 3 simple ways make your home more relaxing. Try one or try them all today! How do you enhance the comfort in your home? Which strategies will you try? Let me know below!